The Twin Block is great for releasing the traps, rhomboids, calf muscles (Gastrocnemius), levator scapulae and many of the muscles groups targeted by the Medium Block. To realize the full benefit of this tool we do recommend purchasing this tool as part of the Twin Block Pro. However, for those looking for reduced functionality and power without the extra expense, this is a great option. We do not recommend this tool alone for treating tension headaches as the elevation of the head is important to impart the traction required for a proper sub-occipital release. For those who have used Tennis Balls for Trigger Point Massage, the wait is over! 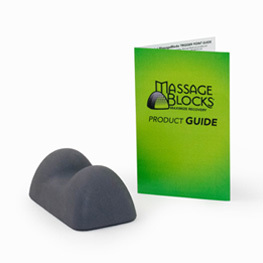 The Neck and Shoulder Tool is a vast improvement to any massage ball on the market, AND it will never go flat. This purchase includes a Medium Knot Finder only.